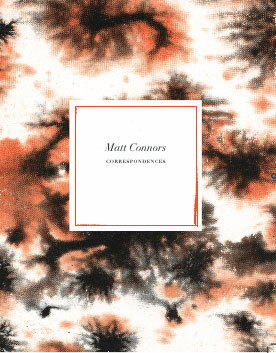 Correspondences is Matt Connors’ first artist book. Taking its inspiration from 1960’s poetry paperback covers, the book acts as a kind of "themes and variations" / exercise de style, deploying a psychedelic template and reiterating it through a limited number of colors and formal iterations. The saturated colors and delicate play of repetition and variation create both a series of linked discreet images as well as an autonomous art object, with color and form creating a narrative rather than text. Printed in stunning offset spot color, Correspondences becomes a sort of abstract flip book, with color and formal information spilling from the cover, to the interior and onto the spine and edges of the book. In addition, each copy has been individually collated by the artist, so that every book has a unique sequence of colors/images, and is unique. Printed and bound in New York City.